Program executes action specified by user (turn off, restart computer, hibernate, suspend, logout user, lock desktop, display text, play sound, run other application). 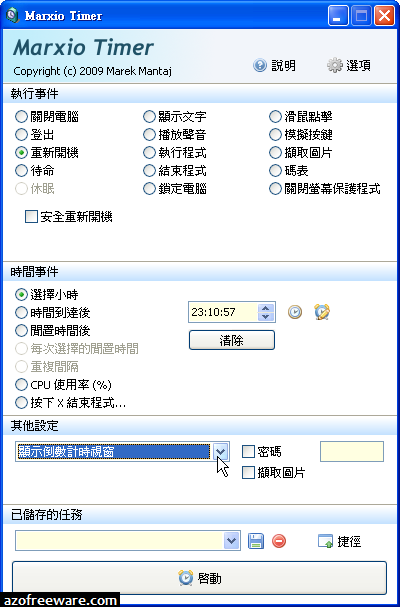 It's run at time specified or when idle time elapses. It can also repeat actions after n minutes or start countdown seconds to execute action. Marxio Timer Portable can display countdown window, can be minimized to icon, on taskbar or hidden from user eyes completely. Started actions can be secured with password - no terminate possible if user doesn't know the right password. Created actions can be saved for further use and shortcut can be put on Windows desktop or autostart group to speed up access to created actions.